I received my copy of the new Spectrum annual and the World Illustration Awards UK annual a day apart from one another and honored to have these two pieces represented in the books. 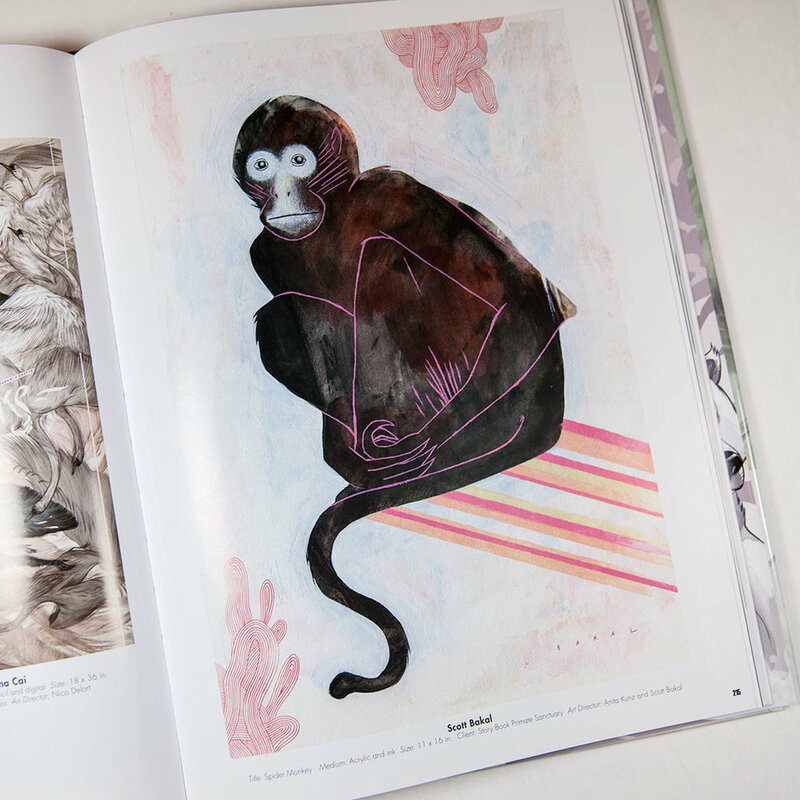 The one above called 'Spider Monkey' is in Spectrum and the image below, made for the Society of Illustrators of Los Angeles Call For Entries poster was in both of them. Big thank you's to the judges and the competitions. In the latest Luerzer's Archive 200 Best Illustrators Worldwide 16/17, I have a couple of spreads of work completed for Tor Books/Tor.com, Liberty Magazine, the Vancouver Opera and a personal piece. Many more pieces were selected but weren't included due to space issues. I'm very happy because the judges selected some of my favorite work of the last couple of years for inclusion. Now and again, some artists in the community get together and paint portraits of our friends for their significant birthdays. My longtime illustrator friend Dave Flaherty turned 60 not too long ago. Dave and his wife have a cute dog named Fritzie. I wanted to encapsulate a sort of 'in joke' with all our friends about his head. The Flaherty Head as its lovingly called. Below are some mono-prints I created as demos for a couple of my classes of his head. I have been honored to find out that the painting above was selected to be included in the Society of Illustrators Annual 58 and was exhibited in New York and just recently, selected to be included in the upcoming 3x3 Annual. Special thanks to Dave and his wife, illustrator and my friend as well, Ellen Weinstein for organizing the project. Earlier this year around March, I got an email from Susan Hodara, a writer for the New York Times Arts Section letting me know that Communication Arts was interested in doing a feature about me and my work for the September/October issue of the Design Annual. Susan drove up from New York to Boston and we spent a wonderful day talking about...well, everything. From the beginning of where I started to where I am now. After she went through her notes and recordings, we had many follow up email conversations cleaning up the details about some of the information that she wanted to focus on. I had no access to the final feature and first read it when I got my issue from my subscription in the mail. I'd be lying if I didn't say I was terrified but very honored and pleased with the whole experience. To read, you can click on this link which will open up a PDF of the feature. Thank you Susan, Patrick Coyne and Communication Arts for the honor of being part of a legacy of amazing artist interviews. I am very honored to have been awarded a Gold Medal for the Book category for the Society of Illustrators of Los Angeles 54th Annual Exhibition. This piece was created for Irene Gallo and Tor.com. A special thank you to all of the judges and the organization. The original painting will be on exhibit at the Gallery of the Society opening November 7th. You can find out directions and information by clicking through the link above. As well as the 'Dogs' painting above, two other pieces done for art director Bryan Gray and Liberty Magzine were accepted into the exhibition. It was an honor to be notified of my selection into the Association of Illustrators (AOI) World Illustration Awards. The series I created for the Boston Globe was 'shortlisted' but was selected to be part of the exhibition. The art for the cover was hung and the entire article was shown in a case in context. It's not often that I am part of shows that do that. It make it special actually seeing how the art is used. My work and the show will be touring around the UK for the next year to various schools and galleries. Since I will be in London in late February/early March, I wonder if I'll run into it? A special thank you must go to Aad Goudappel who was kind enough to send along photos of the event.